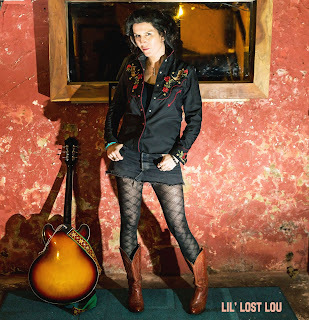 LIL' LOST LOU - DEBUT ALBUM! London-based country/rockabilly songwriter Lou Psyche alias Lil’ Lost Lou here presents her debut solo album. Not one to do things by halves, she travelled alone to Nashville to work with revered producer, songwriter and musician Billy Livsey, a man with the likes of Ronnie Lane, Kenny Rogers, Tanya Tucker and George Strait on his CV. Setting up in the analogue Welcome To 1979 Studios (housed in a former Motown, Chess and RCA pressing plant), Livsey corralled the cream of Music City sessioneers, including bassist Dave Roe (Johnny Cash, Chet Atkins, Sturgill Simpson); pedal-steel player Russ Pahl (Glen Campbell, Patty Loveless, Kacey Musgraves); guitarist Stuart Mathis (Chris Isaak, Lucinda Williams), and drummer Justin Amaral (Junior Brown, Tommy Womack). Let’s let Lou tell the story.... “This Nashville LP was about finishing a journey. It’s a bit more slick than my London skiffle punk/country band, but It’s still pretty raw and I think it has a great cross-cultural sound going on . I’m still so excited that these amazing guys wanted to collaborate on it. Once Lou was back in the UK, finishing touches were applied to the album with the help of producer Sean Kenny at his Ten21 Studio in Maidstone. Born and raised in Camden Town, Lou has shared stages with the likes of Wanda Jackson, Billy Childish, Pete Doherty, Wilko Johnson, The Urban Voodoo Machine and Fat White Family and sang ‘Don’t Bogart That Joint’ over the closing credits of the 2010 film Mr Nice. She plays an Epiphone Casino guitar.